One thing I do like about the Apple Watch is the ability to easily change your watch face. Very quickly, the Watch can go from being a simple time piece to something very personal. 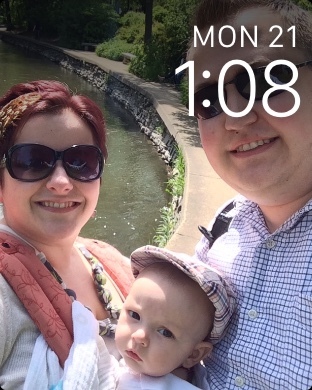 As I’ve now spent 48 hours with a Watch, I wanted to share how I’ve set up my Watch faces. I’d also love to hear comments on how you set up your faces. Activity – The main purpose for buying the Watch was to help me be more active. So having this visible at all times is a must. Calendar – Being able to see when my next meeting or event occurs at a glance is great. Now that I’ve listed all of the complications, here are my Watch faces. This Watch face is my main one. I like the overall appearance of it, as it feels like the kind of watch face I’d want even on a mechanical watch. I have this one when I’m not working (and sometimes when I am). 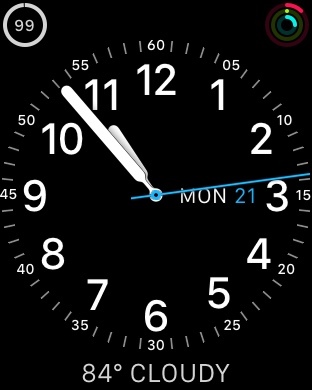 I have the Battery complication in the top left, Activity in the top right, Date with the day of the week inside, and the weather along the bottom. When I drop the Battery one, I’ll move the weather to that corner (even though it’ll only show the temperature) and replace it with the calendar at the bottom. This is my current Watch face during the work day. The center complication is the calendar because of the amount of data it can show. 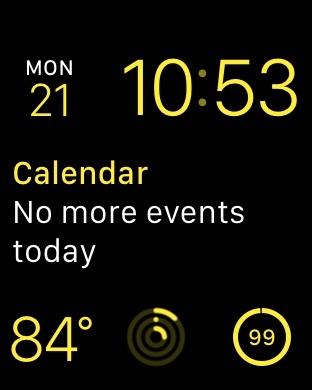 It’s a bit odd to see the time off-center, but I will let that slide given the amount of data all of the complications can show. I thought I would use this one more, but I don’t use it as much anymore. I do like how it’ll show color more than the Utility face. When I go out and want a little fun with the Watch, I’ll use this and tweak the color. I do miss complications when using this Watch face, but this is a fun one to sometimes switch to at night. These are my evening Watch faces for when I don’t need to see data but want to see something personal, especially with the Photo Album face. I look forward to creating some Live Photos next week and making Watch faces out of them. There are other faces I don’t use. I don’t have anything to say on them really. The ones I just listed are my favorites thus far. But I’ve not had my Watch for months like some people, so I’m sure this will change the more I use it. Having had some more time with my Watch, I’ve cut down on some of the faces that I was using before and added a few new ones. 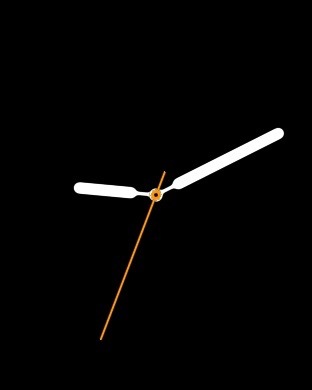 Utility, as mentioned above, is still the same, but it is now my main Watch face. Modular, while still the same, is hardly used anymore. It’s nice, but I find it doesn’t provide me as much useful information while I’m working at my desk. If I was working elsewhere and not always near my computer’s calendar, then maybe I would find it more useful. I’ve made some new additions to my faces. As the name implies, this is a simple face. I use this when I’m out or at meetings. I think it removes enough distractions to allow me to focus on where I’m at without feeling the need to always glance at my wrist. This is another Modular set up. However, I use this one specifically for when I sleep. The center complication is for the app Sleep++ by David Smith. 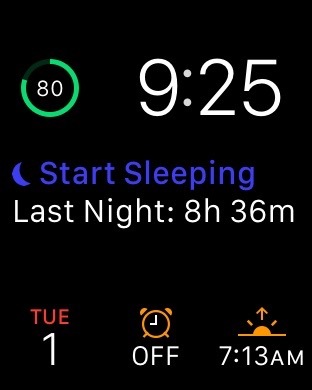 When I’m ready for bed, I’ll switch to this complication, set my alarm, go into Airplane mode, and then tap on the center complication to take me to the Sleep++ app to start tracking my sleep. 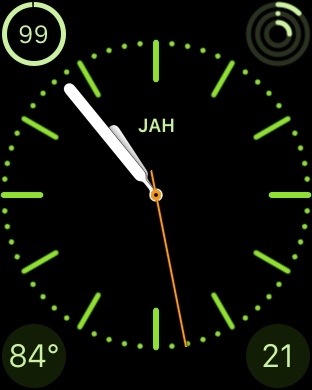 The other complications, including the weather and sunrise/sunset, seem appropriate for this watch face.